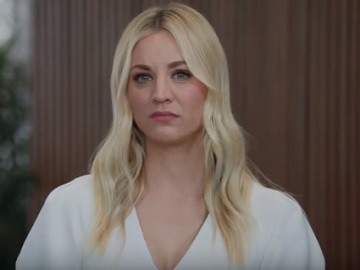 Kaley Cuoco returns to the small screen in two new ads for Priceline.com, the website that helps users find discount rates for travel-related purchases such as airline tickets and hotel stays. While one of the spots urges viewers to mix and match airlines to save up to 80%, the other promotes the Priceline mobile app. “Priceline’s best deals aren’t on these other sites. Our lowest prices on flights, hotels and more are on our app,” The Big Bang Theory actress says at the beginning of the 15-second ad, titled “Laptop”. “Not on my computer?” a man who holds a laptop on his knees asks. Without waiting for an answer, he throws the laptop away and smashes it against the floor, believing he won’t need it anymore. Asked by Kaley if he doesn’t need it for other stuff, he admits he does need it for a lot of other stuff. “For Priceline’s best deals, download the app now,” Kaley says at the end of the commercial. Among the celebrities that have appeared in commercials for Priceline there are William Shatner, who became the company’s spokesman in 1997 and starred in various campaigns until 2012, Star Trek star Leonard Nimoy and Long Island Medium star Theresa Caputo. Kaley Cuoco joined William Shatner as his fictitious daughter in the company’s ads in January 2013. Soap opera sensation Ashley Jones has also made an appearance as Kaley’s friend in one of the commercials released in 2017.